The Scottevest Chloe Hoodie is a lightweight and stylish multi-pocketed hooded jacket, designed for women. 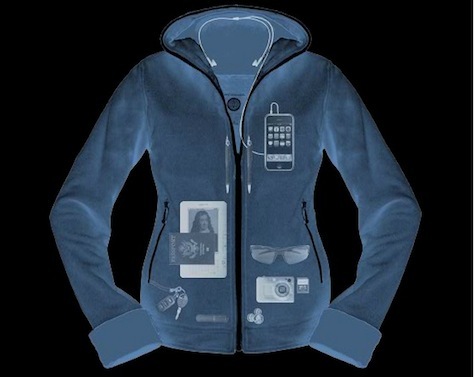 The multiple pockets are capable of holding many items, freeing the wearer to leave her purse at home. The $90 price may be a bit high, however the functionality and innovative design may justify the cost. Personal Area Network (PAN) is a patented feature providing a network of hidden channels to connect wires to devices stored in the pockets. PAN is included in all Scottevest products. Weight Management System is a trademarked feature designed in the fabric of the shoulder area that evenly distributes the additional weight of devices stored in the pockets. Eyeglass Chamois is a removable eyeglass or sunglasses cleaning cloth. Extensible, removable key holder is a detachable clip with an extensible coil allowing secure storage and easy access to keys. Budbuckets is another trademarked feature providing ear-bud pockets in the front collar of the garment. This feature prevents the ear-buds from bouncing while you move. Travel Document Pocket is a conveniently located pocket designed for storing boarding passes, passports, etc. MyMemory Pocket is specially designed pocket to safely store memory cards. Pen/Stylus Pockets is a long, narrow pockets that are perfect for storing pens or PDA styli. They can be located on either side of the zipper. NoBulge Pockets feature is accomplished via special design and construction methods to prevent the items from making unattractive pocket bulges. PadPocket are specially designed to hold large devices like an iPad, Kindle, books, etc. Change Pocket are small pockets designed for loose change. Hand warmer, kangaroo zippered pockets in front. This is an impressive list of features. I found the lightweight material perfect for cool California nights. Every feature listed above worked extremely well. I was able to store my iPad, iPhone with ear-buds, pens, keys, credit cards, coins and cash securely for my walks with my dogs. The weight was easily distributed and much lighter than a backpack or purse. Not having to carry a purse on short errands is fantastic. The Budbucket feature which keeps the ear-buds from bouncing is idea for runners. In addition, the PAN feature ensures connections to devices are secure. Air travel is worry free. Ladies know that our handbags are considered one of the two bags allowed on-board for air travel. The Chloe Hoodie can easily substitute without you having to store sensitive items in the airplane’s cargo or overhead bins. My only complaint is the color options and the material. A couple of my friends described the gray fleece of the Kiss color option as rat fur. Not a pleasant description, to say the least. These were the minority opinions, since I received a number of compliments on the color combination. In addition, the limited sizes (no XXS or XXXL) literally leaves petite and plus size women in the cold; while the $90 price may also freeze out the price conscious buyer. Complaints withstanding, I absolutely adore my Chloe Hoodie. I plan to drop some heavy hints to family members that the Dare and/or Magic would be great holiday gifts. My short trips and air travel will never be the same. Thank you for sharing the great review, Vicki! The Chloe is one the SeV favorites among the women in our office. Stay posted because we are coming out with a few new styles of the Chloe. You will love them! I am eager to see the new products. It was a pleasure reviewing the Scottevest Chloe hoodie.